09-30-15 KTRE Fate for horses at Fort Polk? 09-30-15 KPLC Fate for horses at Fort Polk? 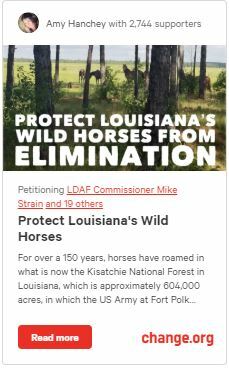 12-19-16 EQUUS Whither the “Wild” Horses of Louisiana? 01-10-18 Leesville Leader Fort Polk horse removal on hold? 01-11-18 KALB New group of Ft. Polk horses rounded up, now what? 08-16-18 KALB Alexandria, LA Local rescue says they saved a group of Ft. Polk horses from possible slaughter.